I’m dreaming of a green Xmas. Well it’s December 26th, and we have made it this far into the holidays without creating too much extra trash. For wrapping, I make gift bags for everything that we reuse again and again. Mrs.Claus came on the night of the 24th. We had to send a special letter requesting Santa not come in because the child wanted Mrs.Claus and a girl elf to come instead. Even though we are trying to move our celebrations to the 21st, they are very busy at the North Pole so for now we still have 2. Santa (or Mrs.Claus) fixed my watch, brought the whole family socks, underwear and oranges, and (d’oh) candy canes, which do have packaging as well as organic gummies ( also packaged). I almost got away with no candy canes but I’m a sucker and when the wee one saw them at everyone else’s home and asked, I caved in. Sprout got wooden doll apartments from my brother and a gorgeous doll house built by Kyle. Santa brought some Plan Toy furniture for it (which is packed in paper bags (soon to become puppets) and cardboard). We had lentil loaf, sweet potatoes, vegetarian gravy, cloud fluff (aka mashed potatoes), squash and blueberry pie as our feast today, and we made peanut butter chocolate chip cookies (from bulk ingredients) for Santa and Co. on Christmas eve. 2 plastic wraps from Cd’s, 5 little plastic doohickies from the socks and undies, 5 bunny gummy packs, and 12 candy canes wrappers. I’m not counting the plastic from the tree lights because it is being used as a ladder for the little dolls in the doll house. Before Christmas, I sent a letter to some family and friends explaining we don’t do wrapping paper and we are trying to support sweatshops. I forgot the “not” after trying but everyone knew what I meant so only one person caught it (and is still laughing). Apparently I say “sweat shop” way too much because yesterday afternoon the girl spent at least an our shopping at the sweatshop in her room, and strangely enough “bought” the things that probably were made in sweat shops. Fortunately today she was back to playing in the doll house. We did it! We celebrated Aurora’s b-day garbage free (or pretty close). Aurora and I made invites, mostly out of new materials but there were some pieces of paper and cardboard from nylon and naan bread packages. We included a note about trying to be garbage free to curb packaged gifts and wrapping paper. Another way to do it is to simply ask for no gifts, but we love presents so we couldn’t do that! Kyle made the cake, getting ingredients in bulk. I made buns and provided a simple sandwich and veggie with hummus supper (with help from some friends-thank you!) Drinks were iced tea (home made), water and coffee (for adults). Her gift from us was tap shoes second hand from Kijiji and recycled drawing paper, wrapped in a cloth reusable bag. I’ll post pictures of those in part two. Instead of loot bags I made little animal party hats out of felt for everyone to take home. It was a bigger project than I had hoped and of course I started late, and my sewing machine (the new one) refused to work, so my mom was employed as slave labour to hand sew. I have to be honest and say that it was really hard work and a few times it crossed my mind how easy buying convenience food would be, but alas I persevered;) Everyone had fun and it was a guilt free party. We also had face painting, which wasn’t entirely garbage free because the box of Snazaroo face paints came wrapped in plastic. I did most of it, but I also had some help from my friend Jill. At the end of the photo gallery, I’ve included pictures of a felt board we made for another friend who was turning 3. Hand-made items tend to produce less trash because they don’t have packaging. This project is also a great one for using up small scraps, as are the animal hats. I’ll have to do another post with recipes and photos of the food and at least our gift. I have a really good excuse for not blogging for a month and here is the photo evidence! I have been crafting like crazy to get ready for the Mulberry School Winter Fair. All of these things were inspired by a need/want to reduce trash and have a creative outlet. I started making deodorant, toothpaste and cream for me and my family as a way to avoid getting containers every time, and also so I knew exactly what was going on and in our bodies. Unfortunately, now that I am selling it, I am creating trash again. I ordered containers and some raw ingredients for New Directions Aromatics. Each little tin had a small Styrofoam circle in the top and everything came in bubble wrap! Almost all my other products are in mason jars, which only come in cardboard, but labels (that I don’t use) come with them in little plastic sleeves. I am offering a dollar off if you bring your container back to me, but I’m not sure how else to solve the problem. I have had people ask for the bubble wrap for felting, so at least it will be used again. To be honest, I let Aurora dance on it and she loved it, but it feels like it’s a bit of a waste. The sewn goods are made from a combination of new materials and up cycled clothing, curtains etc. I am never going to make hankies again because I don’t have the patience, but the gift bags are easy and fun and can also be used as produce bags at the market or grocery store. I sold out of most things at the Mulberry School Winter Fair and I made more to sell at Made 4 You. If you are not in Kingston and would like something, please e-mail me. 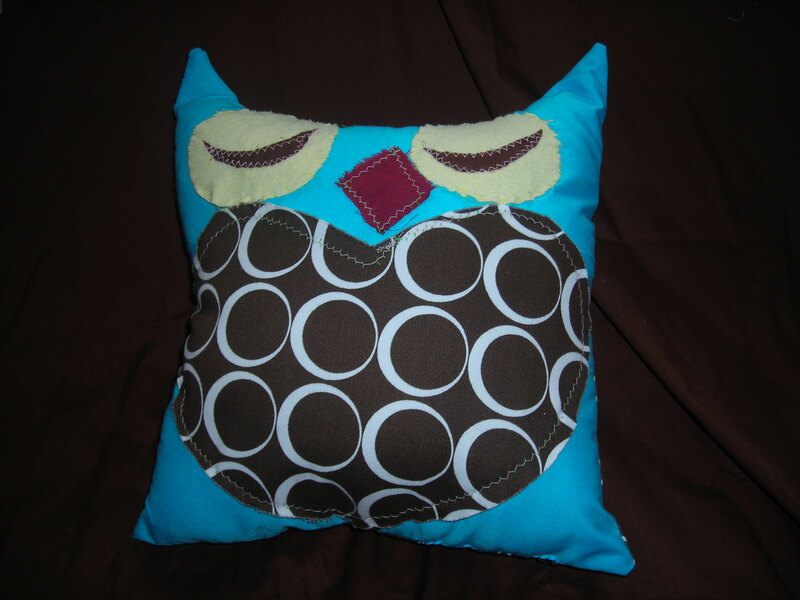 I can’t sell the owl pillows here because there is another crafter already doing so and everyone is afraid to buy mine, so if you want some owl pillows, let me know! If you are in Kingston, buy stuff from Made 4 You and talk about how great it is. I am sort of on probation for the first month, and I really want to stay on there! Here are some recipes for some of the most popular items, if you are so inclined to made them for yourself. Melt the beeswax over low heat with the water. Spoon in cocoa butter and blend. Gradually blend in oils. Pour into glass jar. Will thicken as it cools. Approximately equal amounts of Vegetable glycerin and baking soda, a very small amount of salt, about a teaspoon of organic peppermint extract(to taste). Mix well will hand blender or whisk. Use a mixer, like a kitchen Aid to mix 1.5 parts baking soda to 1 part coconut oil. I adjust the amounts until the constancy is like a thick cream. Add 1 teaspoon of Vitamin E oil, and a few drops of both patchouli and sandalwood essential oil. The sandalwood I get is mixed with jojoba oil because it costs $10 that way as opposed to $50 for pure sandalwood. That’s all the time I have, but I have about 5 other posts brewing so stay tuned! I love Halloween. It’s my birthday, and surprisingly enough, my favorite holiday. This year is especially exciting because Aurora is now old enough (one) to enjoy it; and we are in the main floor of a house so we can give out candy. Once Halloween started getting closer, the moral dilemma hit me. Candy these days is not only full of all sorts of dyes and scary chemicals, but it is also very very packaged. I can’t do bulk or home-made for Halloween because some psychos about 20 years ago did things like putting poison in popcorn and razor blades in apples so now parents only let their children eat sealed goodies. I thought of giving out little Halloween pins, or Playdough or something, but the general consensus from my friends and family is “kids want candy”. I could get organic candy but it is still packaged, and more expensive, and I’m not even sure kids would appreciate it. Probably they would need to trade 6 or more organic lollipops for one Nestle chocolate bar (shudder). My brother in law said if he came to my house and I gave out organic candy, he would egg the house for sure. Despite all that, I did a search for organic candy with biodegradable wrapping. Through this blog, I found College farms candy, which is pretty much exactly what I was looking for, but also leads to my third dilemma. We are short of money and trying to remember that when we make purchases. So, even if I had the time to order the perfect candy form the internet, once shipping and taxes are added, it’s just too much to pay. I searched a bit in stores I frequent, but no one had it. It may be at Whole Foods but as a whole, Whole foods is too rich for my blood, so I haven’t even tried. Kyle suggested cans of pop- not very nutritious, but a big hit with kids, and the package (can) is at least recyclable. I wasn’t totally sold at first because I think pop causes a lot of health problems, but then Kyle told me he used to change costumes and go back to the houses who gave out pop. Maybe I can throw nutrition out the window for one very special night. I’ll just think of all the happy children who will be leaving my house, rather than all the possible diabetes cases. Sorry this is quite late. We were really busy and then I got sick. Here’s a picture of what we do instead of a Christmas tree. When Kyle worked as a pastry chef, he brought a lot of stuff home so it wouldn’t go in the garbage and one thing we ended up with was a surplus of strawberry containers-they didn’t even recycle them where he worked so he brought them home. We decided to make a Christmas tree out of them. We figured it was a better option than a fake tree because we are not producing more plastic, just using what already exists. Here it is. We’ve decorated it with holly from his new job, home made decorations, second hand finds and stuff people gave us. Unfortunately I think there is also some stuff from the dollar store from a few years ago. Another options is edible decorations- fruit loops (from Bulk Barn) or popcorn on a string, cookies etc. That’s what they did in the olden days. If you don’t like plastic, you could get a live tree, but you have to be careful to keep it alive. You can’t just plant it outside in the cold after it’s been in the warm, cozy house because it will die. You can talk to an arborist if you are interested. The folks at LEAF are friendly and knowledgeable. I’ve been thinking about doing the obligatory Christmas post and I realize, I have so much to say that it won’t all fit into one! So heres’ the first installment. Let’s call it gifts and Wrapping (catchy title huh?). Here goes. Coupons to do things for your friends and family make awesome gifts. Redeem this for 2 hours of babysitting, one home cooked meal, one clean bathroom etc. Or if you also don’t have time, hire a housekeeper for them or get a hairdressing, spa, massage or shiatsu, bike tune-up….etc etc gift certificate. Craft Fairs, church Fairs or local artists sites have a large variety of unique local gifts to choose from. On Saturday, Aurora and I went to a green gift fair put on by GET and found some pretty great stuff-mostly gifts to me though! Front Door Organics allows you to buy a fresh box for some one you love, or to donate one to the food bank. You have to be careful if you are garbage free though because sometimes there are bags are plastic boxes included. Also making people soup or jam or cookies usually goes over well. If you’ve got the time- why not make your gifts? Past gifts I have made include t-shirts, knitted scarves or wrist bands, and cookies. Check out ideal bite for more idea’s. My Mom always made us gift bags. If you sew, it’s very easy and then you can reuse them for lunch bags or to keep your treasures in. Kyle uses one that I made him to keep books that he is reading in. I’ll try to post a picture soon. You can also buy fabric gift bags at Grassroots. You can also reuse old wrapping or newspapers. When I was in art school, I wrapped all my gifts in unwanted drawings done on newsprint. People were usually pretty pleased-sometimes they kept the drawing too. We also keep all the regular (non fabric) gift bags people give us and give them again. Oh and at my baby shower, lots of people wrapped their gifts in tea towels and fabric ribbon, which I thought was a great idea! Say No to Trash · Attempting to eliminate our household garbage production. Refuse refuse!